*SHORTLISTED for The Fortnum & Mason Food & Drink Awards 2016* This is a book about tea but not as you' ve ever seen before. It takes the core information about tea but presents it in a highly original and entertaining way. It uses infographics and illustrations to convey facts and figures as well as other informative content. With five parts, the book starts off with a celebration of tea-drinking around the world: from drinking masala chai in tea shacks in India or from a samovar in Russia, to the dramatic pouring of Moroccan mint tea and the brewing of a salty butter tea in Tibet. Part two is an illustrated timeline that takes you through the history of tea in a humorous and engaging way.Part three - From Plant to Pot - explains in a simple but informative way the origins of different teas, where they come from and how they are processed. Take a visual journey, with the tea leaf, and see what happens during the processing business as well as learning about the different types of tea and what each needs to bring out its very best in terms of taste. It' s here, too, that we meet the people behind the tea estates that teapigs deal with. Part four explains everything you ever wanted to know about drinking tea. Should you slurp or sip your tea? Follow in the steps of a tea taster and learn how to taste like a pro. Is a cup or a bowl best for drinking tea? The book takes a look at all kinds of drinking vessels from across the globe. To dunk or not to dunk - that is the question? Teapigs subscribers give their top 10 biscuits to dip in a cup of tea, does your favourite biscuit feature?And how can tea influence your mood? The fun but informative mood-o-meter shows you how to pick the right tea to cheer you up or calm you down. Plus, discover a whole tea chest of health-related benefits. 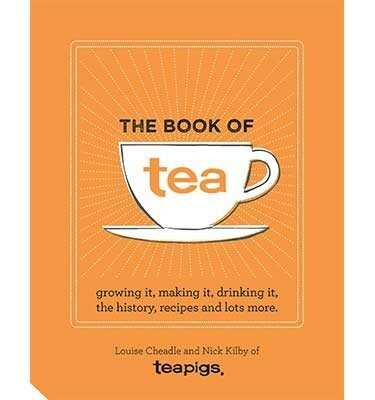 The last part of the book is packed with 30 or so recipes, offering inspiration for using tea in cooking or partnering recipes with the best teas.